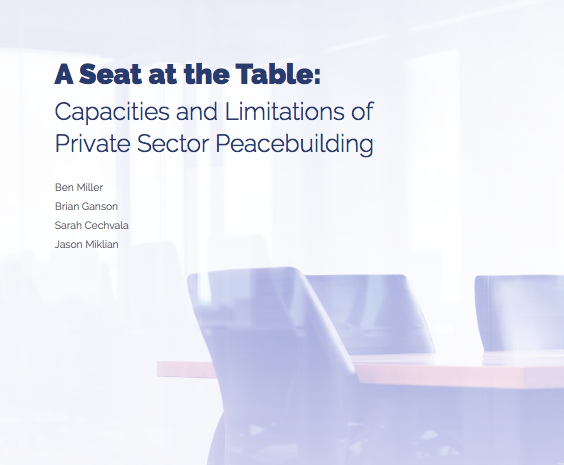 A Seat at the Table is the capstone report of a two-and-a-half year learning project entitled “Engaging the Private Sector as a New Peacebuilding Actor.” It documents the efforts of individual companies, as well as those of associations of companies acting collectively, as they sought to transform the dynamics of conflict unfolding around them. The analysis identifies patterns that are common to effective approaches to peace and conflict by private sector actors, and the specific means and resources through which private sector actors implemented those approaches in successful cases. It offers insights for individual companies, for peacebuilding actors, and for policy organizations seeking to define and establish a role for the private sector in efforts to address fragility and conflict. The report systematizes and builds on insights gleaned over the course of the project through literature reviews, case study development, and consultations with a range of experts.